Active: In order for your Newsletter to send on the scheduled date and time, it must be checked as Active. After a Newsletter is automatically sent it will need to be rechecked as Active. For example, say you have a Newsletter scheduled for every Wednesday at 9am. After 9am on Wednesday and before the next Wednesday, the Newsletter will need to be reactivated. Name: This will appear as the subject line in the email. From Name: This will appear as the name of the sender. A common from name is your organization’s name. From Email: This will appear as the sender email and will field any replies if allowed. Send Every: You have the choice of daily or once a week on a specific day. As a reminder, after each send you will need to recheck the Newsletter as active. As for time, there are six options: 7am, 8am, 9am, 12pm, 2pm, and 4pm. These times are in Eastern Time and the times are approximate. Theme: You can either use the default theme or select a custom theme that you have added on the Newsletter Landing Page in the Admin Dashboard. 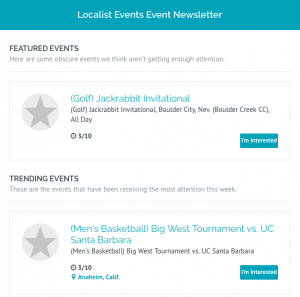 Automate Events: If this is selected then your newsletter will pull events according to Localist’s trending algorithm. If you wish to manually select unrelated events then you will need to uncheck this field and select save changes. After saving, you will see a Content section appear on the right-hand side. Selecting +Add Content will take you to a custom form. If a Featured Event is curated, then the Newsletter will automatically divide itself into three possible sections: Featured Events, Trending Events, and Popular Places. Number of Events: You have several options between 1 and 30 events. Sort Events: When automating events, you can choose to keep the list sorted by popularity or by date. Event Type, Topic, Target Audience, etc. (any Filter Family you have set on your platform will appear with a drop down): If specified, any event that is assigned this Filter Family can be potentially pulled into the Newsletter. Group or Department: This list corresponds to the Group Pages and/or Department Pages on your platform. Getting your Classifications set is the first step in implementing Localist. This way, when you’re ready to promote events for Newsletters you already have populate Classifications to select from! Read more about Classifications here. Date Range: You can specify to pull from a window of 1 day with options up to 6 months. Keep in mind that the number of events you have specified to include can possibly fall in a shorter date range than specified. Automate Places: If selected, Localist’s trending algorithm will include a list of popular Place Pages under the list of events in the Newsletter. Similar to events, if you wish to manually select unrelated Places, you will need to select + New Content on the right-hand side of the page. This will take you to a custom form where you can add Places by name, change the titles/subtitles of each Newsletter section, or add content to the body of your Newsletter. Number of Places: You have several options between 1 and 30 places. Place Type: This will limit the Place Pages pulled into the Newsletter to those that match a specific Place Type. The fields under the Events section, such as Event Type, Group, or Department are match any. This means that if an event matches at least one of the specified Filters or Group/Departments, it can potentially be included in your Newsletter. If you’d like the Newsletter to send on the next available day, you need to CHECK ACTIVE! If the event is not checked as active then the Newsletter will not send. While in the Newsletter’s edit form, you will see Email Preview and Browser Preview in the top right-hand corner. Email Preview: This option will prompt you to enter an email address so that Localist can send you an email version of your completed Newsletter. Browser Preview: This option will open your Newsletter in another browser. By default, Newsletters send to all users who are registered in Localist. However, you can upload your own list of recipients to send Newsletters to specific target audiences. Your custom Newsletter recipient list can have up to 4,000 emails included. If using a custom Newsletter list, there is a limit of 4,000 emails per Newsletter, and not per upload. Listserv emails count as one email address. 2. Select +Add Newsletter or select an existing Newsletter. 3. If you are editing an existing Newsletter, you will see a Recipients section to the right of the edit form. If you are creating a new Newsletter, you will need to build your content and Save Changes before this option will appear. 5. To add recipients, you can search for individual users in the system by entering a name in the search bar then selecting from the drop down OR you can upload your own list by clicking +Add Recipients. 6. Overwrite List: If the Newsletter already has an existing list of custom recipients OR if you modify the initial list in the future, checking Overwrite List will remove the existing email addresses and replace them with the emails you are adding. If you do not check Overwrite List, the new emails will be added in addition to the list of existing emails. Email Addresses: You can enter in the format email address, user name on each line or you can list email addresses on their own line. Upload Spreadsheet: Your file should be structured with one email and one name per line. After building your spreadsheet you will need to export the file as a CSV. A custom Newsletter theme allows you to modify the default Newsletter theme to match your organization’s brand. 2. On the Newsletter landing page, you will see a section titled Themes. Copy HTML From: you can copy the HTML code from the default theme or another custom Newsletter theme to modify OR you can select none, which will give you a blank start. 1. From the Newsletter landing page (Content > Newsletters ), select an existing newsletter or + Add Newsletter. 2. You will see a field called Theme with a drop-down for you to select your desired theme. When building a Newsletter, Localist can either automatically pull in content according to the Filters, etc. you have specified OR you can add custom content that allows you to pull in individual events. Whether you’re adding custom content to a new or previously created Newsletter, you’ll need to uncheck Automate Events and Automate Places. This will hide the other event Filters, Places, etc. so you’re able to add your own custom events and Places. 3a. If the Newsletter is new – uncheck Automate Events and/or Automate Places. Save Changes. After saving, the Content section will appear on the right-hand side of the page. 3b. If you’re editing a previously made Newsletter, the Content section will already be displayed. 4. Select + New Content on the right-hand side. Scheduled: Just like the main Newsletter content, custom content must also be checked as active (Scheduled) before each send. Send Date: You will have the option to include the content in tomorrow’s Newsletter and up to 15 days in the future. The date must match the day specified in the main Newsletter. For example, if the main Newsletter is set to send on the next Wednesday, but the custom content is set to send on Thursday’s date then it will not be included. 6. 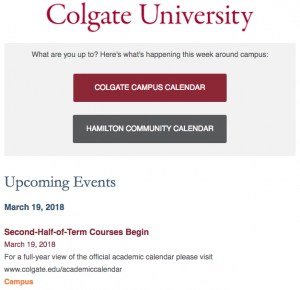 Featured, Events, and Places Sections: These portions of the custom content form allow you to mimic the functionality of the default Newsletter by manually assigning items to each section. Title: This is the main header for the section. Subtitle: This is displayed underneath the main header and can be used to add context for your audience. 7. Body: This space can be used to include non-event content to your Newsletter. This will display at the top of the Newsletter. 8. Select Event and Place content for each section. After the Featured, Events, and Places fields for assigning a Title and Subtitle you should see another Events and Places section with fields to add items manually. If you do not see this section then Automate Events is still checked. Navigate back to the main Newsletter, uncheck Automate Events then Save Changes. After saving, click + Add Content. 9. Adding Events: start typing the Event Name and select it from the drop down – this will add the event to a list below. Selecting Add Feature will include the event in the Featured Events section of the Newsletter. Once two or more events are added then you can manually arrange the events in a custom order by selecting the down or up arrows to the left of the event titles. If an event is not added to the Featured Events section, it will be added to the Events section. 10. Adding Places: start typing the Place Name and select from the drop down – this will add the event to a list below. The Places list order can also be rearranged by using the down or up arrows. 11. When you’re finished adding your content, confirm that the date selected matches the date of the main Newsletter. Remember to CHECK SCHEDULED and Save Changes. 12. Once the custom content is saved as Scheduled, the custom content’s date will be listed under Content on the main Newsletter’s edit form. 13. Navigate back to the Newsletter’s main edit form, check Active and Save Changes. Leave Automate Events or Automate Places unchecked if you have added custom content for each as this will override the custom content. While in the custom content form, you will see Email Preview and Browser Preview at the top of the page. Email Preview: This option will prompt you to enter an email address so Localist can send you an email version of your completed Newsletter. Browser Preview: This option will open the Newsletter in another browser. Looking to use Localist with MailChimp or another external mail system? No problem! You can export content built using Localist’s Newsletter tool. This will grant you access to more robust Newsletter metrics while still allowing you to quickly and efficiently populate a Newsletter with event-related content. There are two ways to accomplish this, via the Newsletter builder or the Widget builder. 3. While in the Newsletter’s edit form, you will see Email Preview and Browser Preview above the content. 5. While on the Browser Preview page, right click and view Page Source. 6. Copy the resulting HTML and paste it into your external mail client. 2. After specifying the widget parameters, select the Preview Widget button. 3. While on the Preview Widget page, right click and view Page Source. 4. Copy the resulting HTML and paste it into your external mail client. This will export a CSV of all available user information. Only Platform Admins have access to the Users page. Q: Can we use a ListServ? A: Yes! Just set the ListServ address as a custom recipient. This will count as one email address. Q: Who can create Newsletters? A: Only users with the Platform Admin permission can access, create, and send Newsletters from the Admin Dashboard. Q: Why can’t Event Admins create Newsletters? Since Newsletters can be sent to all users (which for many platforms is thousands of users), only the most trusted users should have access. Allowing Newsletters to be made by more than just key managers opens the risk of over saturating users’ inboxes with emails. This is the same reason why Event Admins cannot access the users list in the Admin Dashboard. Sending Newsletters goes beyond the scope of event management (adding and editing items). Event management is the primary function of an Event Admin, and crosses into communications and marketing. In our experience, the bottom line is that if a user can be trusted enough to create and send Newsletters on the organization’s behalf, they can also be trusted to avoid changing calendar settings. That said, nothing in Localist can be done anonymously. An overwhelming majority of our customers have requested that Event Admins should remain limited in their capabilities on the platform. Q: Why are there pre-selected times to send Newsletters? A: The pre-selected times reflect the times that have shown the highest amount of traffic for Newsletters. Q: How do Users subscribe to a particular Newsletter? A: It’s either all or nothing. Many Newsletters can be added or removed at any time by editors, and custom recipients can be defined on a per-Newsletter basis. Allowing users to pick and choose which Newsletters they see would require them to continually check their settings to see if new Newsletters have been added. Additionally, if a Custom Recipients list is defined for a Newsletter, the user wouldn’t receive it even if it were added to their list. Q: Why does a Newsletter have to be rechecked as “Active” after each send? Can that be changed for our platform? A: Changing the activation on a Newsletter is not a per-platform setting and it’s something we have to go with the consensus on, which is it deactivating after every send. This is pretty standard for any Newsletter platforms out there, like MailChimp. This ensures that Newsletters aren’t sent automatically when they are not intended be sent. Q: How is Newsletter traffic separated from other traffic?